Heat oven to 350°F. Cut six 1/2-inch slices from frozen cookie dough. On ungreased cookie sheet, place slices 2 inches apart. Bake 10 to 13 minutes or until golden brown. Cool 2 minutes; remove from cookie sheet to cooling rack. Cool completely. To assemble clowns, using 1/2-cup ice cream scoop, place 1 rounded scoop ice cream in center of each cookie; press down slightly to secure. Place cone, wide end down, on top of ice cream; arrange to form hat. Freeze until firm. 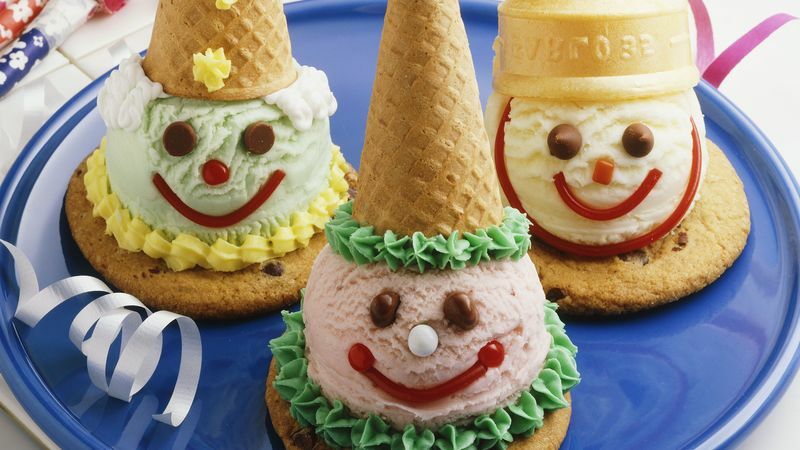 Remove clowns from freezer; press candies into ice cream to form eyes and nose and licorice to form mouth. Use frosting, decorating bag and star tip to make collar around ice cream and decorate cone hat. Freeze until firm before serving.